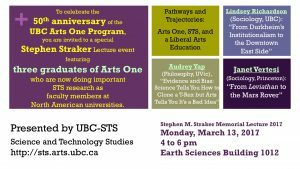 The UBC Science and Technology Studies program hosts the Stephen M. Straker Memorial Lecture each year, and on March 13, 2017 they teamed up with Arts One to kick off the 50th anniversary year of Arts One (2017-2018). Stephen Straker taught in and was a prominent supporter of both Arts One and Science and Technology Studies at UBC. The lecture was made up of a panel of former Arts One students, talking about how the liberal arts, and Arts One, connect to their current work in Science & Technology Studies. Dr. Richardson talked about how Émile Durkheim’s view of the role of institutions in shaping behaviour and social integration, has influenced her research on public health in Vancouver’s Downtown Eastside. One of her research projects is looking into “cheque day,” when income assistance payments are made on the same day for all recipients, once a month. Drug use goes up on those days, bars stay open 24 hours, there are elevated demands in public health services, and more. In an experimental pilot study she is leading, a community bank is releasing cheques on different schedules to see if drug use and drug related harm on cheque day could be reduced. Early indications are that people are responding differently to being paid at different times because of different individual and social circumstances. Arts One and STS both promote critical thinking in the sense of interest in and commitment to fundamental questions that can be approached from multiple perspectives and disciplines. “Seeing isn’t innocent”—observation is theory-laden and affected by prior knowledge and images. For example, the iconic map of the London tube system affects how people think of the city. In addition, sciences require different forms of seeing; one has to be trained to see in certain ways. For example, when Galileo looked through his telescope and drew images of the moon as he saw it there, one had to be able to understand that the light and dark patches in his drawing could be mountains and valleys. New visual technologies & representational strategies—what do visual technologies, such as digital cameras that can see things unaided eyes can’t, contribute to how we see? When one is dealing with a robot like the Mars Rover, seeing becomes communal: the team had to come to a consensus about what the rover was going to see and do each day. Dr. Yap focused on a common thread amongst the three presentations: that knowledge is situated and social. She discussed the relationship between science and values, and questioned the call for “objectivity” in science that would require the attempt to get rid of all “values.” Dr. Yap argued instead that there can be a productive relationship between science and social values: it is inevitable that some social values drive what science we do (e.g., health harm reduction), and science should inform our values and our social practices and institutions. Science can also benefit from sociologists, historians, philosophers and others asking questions about science, such as questioning conceptual frameworks (such as gender), or investigating the institutional structure of knowledge creation, that may affect scientific work in problematic ways. In the discussion period after the presentations, the panelists shared some further thoughts on what Arts One gave to them, including: interdisciplinary conversations that continue in their academic work; and (related) combining topics that others might not have thought to put together or don’t want to see together but that, when combined, provide valuable insight. This event was an enlightening showcase not only of current work in STS, but also of the value of interdisciplinary programs like Arts One that can affect how one thinks far into the future!